Ideal for beach holidays and activities on sand. Soleil Anti-Sand has a light non sticky texture which offers fast application and absorption therfore less mess, sand will just brush off. 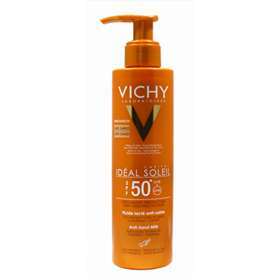 Vichy Ideal Soleil Anti-Sand SPF 50, broad spectrum UVA + UVB and enriched with Vichy Mineralising Thermal Water keeps skin hydrated as well as offering high protection from UVA/UVB rays. Also available Anti sand SPF 50 high protection for children in easy to apply spray. Suitable for body and face. Presented in a pump dispensing bottle for less waste. Over exposure to the sun is dangerous. Keep babies and young children out of direct sunlight. Do not stay in the sun for too long, even when using a sunscreen product because it does not provide you with 100% protection. Apply the sunscreen product just before exposure. Reapply frequently and generously to maintain protection, especially after swimming, perspiring or towelling. Avoid contact with fabrics. Limit the amount of time you spent in direct sunlight, keep well covered, including hat, T-shirt and sunglasses. Aqua/Water, Dicaprylyl Ether, Homosalate, Octocrylene, Dimethicone, Ethylhexyl Salicylate, Nylon-12, Styrene/Acrylates Copolymer, Butyl Methoxydibenzoylmethane, Dicaprylyl Carbonate, Drometrizole Trisloxane, Methyl Methacylate Crosspolymer, Cyclohexasiloxane, Polyglyceryl-6 Polyricinoleate, p-Anisic Acid, Caprylyl Glycol, Disodium EDTA, Ethyhexyl Trazone, PEG-32, PEG-8 Laurate, Phenoxyethanol, PolyC10-30 Alkyl Acrylate, Sodium Chloride, Tocopherol, Parfum/Fragrance. Code F.I.L:C192423/1.